Anyway, I found the work so interesting that I knew there had to be a good story behind the company…and I was right! The owners, Liz and Sak Chumtong, met in Thailand, initially on a small touristy street called “Khao Sarn Road”. They fell in love and needed some cash to travel from island to island and so started stringing necklaces to sell to the tourists. Before long, they were a family and then moved to the U.S. Without a lot of money, Liz worked as a waitress and Sak worked as a carpenter, cook and organic farmer. When they decided to start their business, Liz maxed out her credit card to buy silver….and Saki Silver was born. All of their work is done in Thailand where everyone works and lives together at the studio. Sak’s sister even does all the cooking from scratch using herbs from a home garden just outside the studio. I’m always so surprised when people think we’re a really big company! We only have eight employees in Thailand, and half of them are friends and family. So we treat them very fairly. They have paid vacations and health benefits. They all live at the studio, and we also stay there when we go. Everyone gets along so well, and it’s always a joy to be there. It really is like a big family. All the guys call my sister “Mom”. Dealing with Thai people is a joy because they’re so laid back, but still hard working. They’re so respectful and polite, but fun and joking, too. We go many times throughout the year, but the best time is when we take our kids, Mick and Kira, in the summer. They have so much fun and get along with everyone in the studio. My husband studied graphic design, and I was a ballet dancer before we met. So we’re very inspired by clean lines and unique details. I would say we have both been very inspired by modern asian design. Sak is completely obsessed with modern design, even our house is a Frank Lloyd Wright style. Our inspiration comes from everywhere-from tribal designs, to Japanese paintings, to old asian lanterns. I can look at anything and say-“that would make a great toggle!” We try to be as unique as possible. People who design jewelry are always looking for something different, something to set their work apart from everyone else’s, and that’s where we come in. It’s funny when people copy our line because they’re missing the point entirely. It’s a success because it’s different. Everyone could sell what they made if they were truly inspired by it. 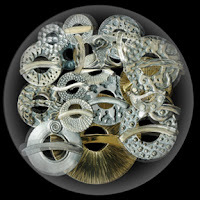 What advise do you have for jewelry designers? My advise for anyone is to design something you think is great! I like to buy beads and components I love, then figure out how they look great together. I usually start out with a pile of beads and turn it into a design. It’s so much harder to come up with a design and then spend days and days trying to source the components. I always see those people at the shows, they’re so frustrated and they pass up all these great new designs because it’s not in the picture they saw online. Let what’s available inspire you. And don’t compare yourself to others! If your designs aren’t selling, figure out how to improve your style, don’t look to others people’s style, because it will never be yours. A good designer has looked inside and developed their own unique style and that is what people can see and respond to! Liz and Sak strike me as a couple who have figured it out– how to work together with joy, create beauty and have fun doing it all at the same time! Stop by their booth at the next show (a list is on their website). You’ll love what you see! It’s my pleasure to share Liz and Sak with you! What a surprise to find your article on Saki, I just love their products and I enjoyed reading about their work. Thank you! Previous post: Meet Lilian Chen: A Remarkable Designer with a Remarkable Story! 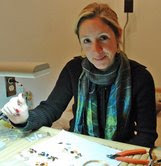 Next post: Meet Deborrah Daher: Extraordinarily Beautiful Work!